1946; American translation by Matthew Ward - 1989. 123 pages. Awards : Camus won the Nobel Prize in Literature in 1957. Genre : Classic Lit. Overall Rating : B. There are two very good 5-Squared reviews of this book; one by Julie here; the other by Amanda here. This is one of those books where it's good to read those reviews first. 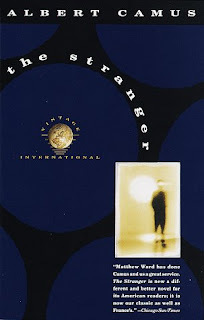 Amanda's gives the plot, but really The Stranger (better translated as "The Outsider") is a philosophy/character study, where the events serve merely as background. The spotlight here is on Absurdism, and you're welcome to read the Wikipedia article on that here. "I told her it didn't mean anything but that I didn't think so. She looked sad." (pg. 35). Well d'uh!, Meursault. Shortly thereafter, Maria asks if he wants to marry her (she's a slow learner), and he replies, "I said it didn't make any difference and that we could if she wanted to." (pg. 41). Yeah, we have a real Romeo here. The central theme of this philosophy is that the world is absurd. Not as in Three Stooges absurdity, but in the sense that it is an indifferent, uncaring universe. There is no such thing as karma; good things happen to bad people, and vice versa. If this is so, Camus offers three reactions; two of which he regards as unsatisfactory. First, you can commit suicide ("life isn't worth living if there isn't any meaning to it"). Second you can embrace a theological rationalization ("if there is no God, I guess I'll have to invent one to bring meaning to life"). The third alternative, adapted by Meursault and the only one advocated by Camus, is to be indifferent to the events in life. Thus, Meursault has little or no reaction to his mother dying, and likewise little or no reaction to his boss's proposal of a key promotion involving the desirable perk of moving to Paris. These are no more important than the sun beating down on his head, or him eating something because he's hungry. Alas for Meursault, this means he is equally indifferent to killing a man, which results in his trial, conviction (he is an absurdly incompetent defendant), and sentence to death via guillotine. At the end, Meursault becomes aware of his impending demise, and in the last couple pages, breaks out of his indifference. Personally, I would've liked the narrative to continue right up to the point where the blade is about to fall, but I suppose Camus knows better than I when to end a story. This is a very interesting book, but only when you're in the mood for philosophical musing, not an event-packed storyline. Absurdism is an offshoot of Existentialism, and The Stranger is frequently said to (also) be an existential story. Everything I know about Existentialism comes from reading Waiting For Godot and Rosencrantz and Guilderstern Are Dead, and the philosophical outlook in those two plays is markedly different. Beyond that, Existentialism is a vaguely-defined entity that no two people seem to agree on ("Progressive Music" is like that, too), so we'll have to wait until I re-read (or someone else reads) WFG or R&GAD for a lively discussion of that. There's a fourth alternative to the world's indifference that isn't discussed in this book, but that Camus adopted in his own life. He isn't like Mersault because he adopts this fourth alternative, which is, in short, human secularism. He was a humanist, and thought that even if life had no meaning, the best we could do was help people be happy. That's something Mersault never learned. I don't think Mersault truly breaks from his indifference at the end. Rather, I think he is unable to be indifferent for awhile because of his fear of death, but by the end, he regains it, and rejoices in knowing he could now care less about death. He is relieved to know that it doesn't matter if he dies now or later, that in the end, life doesn't matter. It's an oddly triumphant feeling. i agree - i don't think Meursault has changed at the end, even though some critics have suggested otherwise. he says he wants a large crowd at his execution, but somehow that sounds like a momentary thought to me. that's why i would like to hear his final thoughts as his head lays in the guillotine. and you're right - secular humanism is a more practical reaction to an absurd world than Meursault's. Perhaps, had he not been put on trial and sentenced to execution, Mersault would have eventually caught on to the humanistic qualities that Camus endorsed. I agree - it does seem like his statement at the end about the large crowds hating him was simply a whim that he was likely to get bored of within a few hours. Just like all his other whims. i don't perceive Meursault having "progressed" at all in 123 pages, so my feeling is that Camus wouldn't ever have him evolve into a humanist. i think Camus' purpose here was just to present Absurdism, and introduce one character's response to it. it's funny - after Kierkegard and Camus, i don't know if there is another, more modern Absurdist. I'm not familiar with Kierkegard, but I think absurdism was fairly central to the times. Right after the holocaust, the atrocities of WWII, atomic bombs, etc. I can imagine why people thought life had no meaning at that point. very interesting commentary because I know next to nothing about philosophy. Suddenly "human secularism" and "absurdism" make sense. Even after reading the story I wasnt' sure what the philosophy meant. I just didn't like Mersault. you're right -- real romantic. Can't imagine what that girl saw in him! Seems like a philosophical position a writer might have taken after something like 9-11. I wonder if there are any modern authors coming at Absurdism from that angle/time period. Marge is desperately trying to blind herself to the meaningless fo her surrounding, all the time, trying to cling to a 'golden past' when everything made sense. She's the one who is religious, the one who wants things to come back to their expected places. I'm reminded of an episode where Lisa decides she's a Buddhist, and at the end, she say she'll still celebrate Christmas and stuff, even though she no longer believes in Christian doctrine, and her mother just sort of says that the illusion is good enough for her. So, she's sort of the Thomas Hardy of the group, fin-de-siecle, desperately mourning the coming of a new, hero-less age. Homer is the, more or less, perfect sensualist, living life for the simple pleasures of the moment - nothing in his life matters except maintaining his comfort and indulging his momentary wants (mmm... donuts... mmm... beer). Life is complete when he has nothing pressuring him into a more abstract, les pleasurable world of thought, and when he has somethign that makes him feel good. He's more of a DH Lawrence of a Gabrielle Colette, sort of, weirdly enough, the flapper of the group. Lisa is the troubled seeker, the person who understands the meaningless of the world, and genuineley believes that if she just looks closer, it will all make snese. She is the idealist, ready to latch on to and believe beautiful and wonderful things, but no in the old way of her mother. She's a revolutionary, a philosopher, less religious and more spiritual. She's more like the great experimental thinkers of the 20th century, sometimes believing crazy things, sometimes transcendant things. She's more like, say, an Ayn Rand, or a Lenin, or something. a Jack Kerouac. THen Bart is the purely practical, amoral member, able to 'enjoy' the moment, but in a way that is outwardly, self-consciously self-centered. HE has fully accepted that the world has no meaning, that pleasure has no meaning, that the soul has no meaning, and is just out to get as much out of life as he can before he dies. He's not a writer, he isn't a thinker - he's like the human being of the group, the mephistopheles who has accepted the worldfor what it is. The central thesis is an absurdist one - that no matter what you believe, you'll end up making a fool of yourself, because none of it is really true. Heaven, hell, life, death, truth, fiction, they are all eminently pliable and meaningless. Jason, it looks like you're thinking along the same lines as Mr. Barca here! I forgot the Simpsons reference in the post until I came back to reread it. :) But I don't think the Simpsons can be entirely construed as absurdist because the show does value something: humor. And consistant humor at that. The Simpsons' world is not devoid of meaning, it's meant to be laughed at. I can't imagine crowds of people laughing at Mersault's life, you know? Camus wasn't trying to show how funny absurdism is. I'm not familiar enough with modern writers/philosophers to know if there are any true absurdists out there. It seems there are a lot of atrocities out there that might lead people to that sort of philosophy, though.